During a career spanning more than 50 years, the USCGC Ingham kept the shores of the United States safe for mariners in both war and peace. Commissioned in 1936, the cutter protected the Bering Sea and the fisheries of the Grand Banks until ordered to participate in neutrality patrols upon the outbreak of World War 2. After America’s entry to the war, Ingham helped convoy hundreds of Allied ships across the Atlantic. On December 15, 1942, during routine convoy operations, the Ingham detected and sank the German U-boat U-626. In late July 1944, the Ingham underwent alterations in the Charleston Navy Yard to prepare it to serve as a combined operations and headquarters and ship in the Pacific Theater. Ingham served briefly as a headquarters ship for General Douglas MacArthur prior to his landing in the Philippines. Following World War 2, the ship returned to peacetime service and her missions included maritime rescue and oceanographic surveying. Ingham was called upon once again to serve in wartime during the Vietnam War. During the war she and her crew became the only Coast Guard cutter to earn 2 Presidential Unit Citations for her naval gunfire support and replenishment missions. Ingham responded to yet another crisis when Cuban dictator Fidel Castro allowed thousands of dissidents to flee his autocratic regime in what became known as the Mariel Boatlift. The Ingham rescued several boaters and towed half a dozen vessels to freedom in the United States. At the time of her decommissioning, the ship was the oldest and most decorated Coast Guard cutter in service. 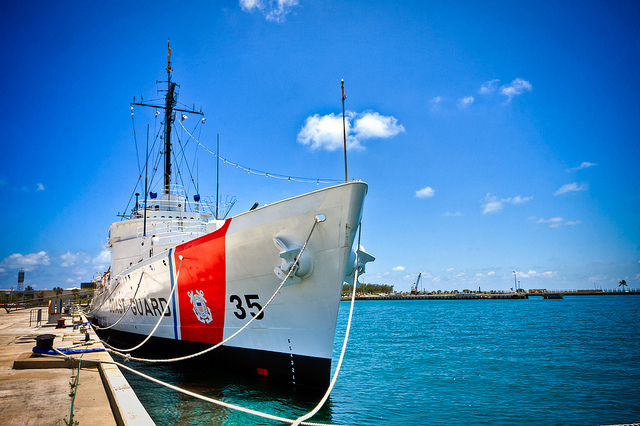 The ship now resides in Key West, Florida as a memorial to the 581 Coast Guardsmen killed in action during World War 2 and the Vietnam War. The ship is open for tours Monday thru Saturdays and more information can be found on their website.